As promised in the post dated 20th June 2008, we will discuss a few more multiple choice questions on electric field and potential. The electric field at any point is the force acting on unit positive charge. The three charges arranged symmetrically along the circle will exert (on unit positive charge placed at the centre) forces of the same magnitude with their lines of action inclined at 120º. The resultant force is therefore zero. Hence the field at the centre of the circle is zero. 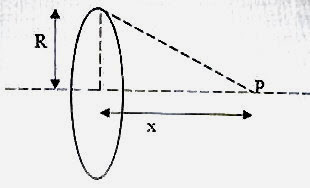 The distance of point P from the charges on the ring is √( r2+x2) so that the electric potential at P is Q /4πε0√( r2+x2) given in option (a). When the spheres are brought into contact they share the charges. The total charge on the system of the two spheres is the sum of the initial charges and is equal to +Q/2. Since the spheres are identical, they share the charges equally so that the charge on each sphere is +Q/4. The final force between the spheres is therefore repulsive and of magnitude (1/4πε0) (Q2/16d2) = F/8. Since the charge on the sphere is negative, the field at P is directed towards right [Option (d)]. Since the point P is inside the first shell, the field at P due to the charges on the first shell is zero as in the above question. The field at P due to the charges on the second shell also is zero since the conducting shell provides electrostatic screening of the electric field produced by the second shell. Therefore the correct option is (e). Since there are no charges inside the box, there cannot be any potential gradient on that account. Since the potential everywhere on the surface of the box is 4 V, there is no potential gradient inside the box on this account also. To put this in a different manner, there is no electric field inside the box and hence the potential at the centre is 4 V itself. Therefore, –2q + Q = 0 from which q = Q/2. You know that a soap bubble has an excess of pressure inside because of surface tension. What will happen to the excess of pressure on charging the bubble? Because of the repulsion between the charges, the bubble will expand, thereby reducing the excess of pressure.